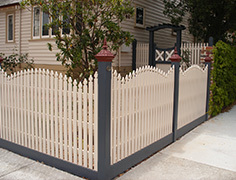 OLD MALVERN PICKETS specialize in design and construction of decorative feature fences, either traditional designs, or custom designed timber and colorbond front fences including a broad range of DIY kits. This is our sole business focus, we do one thing and we do it well. We also provide a range of complimentary services to make sure that the whole fence project is taken care of and is straight forward for our clients.